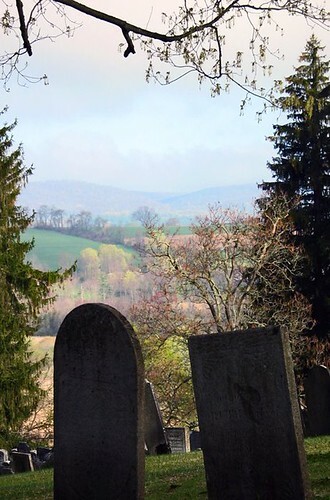 grave with a view, originally uploaded by jahansell. This is one of the first photos I ever posted on SDP - I always imagined that I'd love to have this view for evermore! As usual, more than 100 City Daily Photo bloggers are participating in this theme day. (Evidently I never actually signed myself up, as I'm not on the list, but perhaps a few people will stop by here anyway!) Please pay them a visit! Sublime view....love the colours on the hills. Here in Sydney we've got a sea view! Wow, that is some view! A beautiful view. Something about tress and graves work so well together... good photo. nice to see you on board - found you on the portal and you'll be #87 on my list of permalinks - so far 20 registered sites have yet to post (a few of these haven't posted anything for more than a week so may end up no-showers) and 4 sites that registered have posted off-topics. Wow! It is an amazing view. A resting place with a beautiful view! Delightful and so beautifully framed! Your photo and Jilly's (Menton DP) are my favorite theme shots. What a great and unusual perspective; those early spring colors are so unexpected, given the foreground. Lovely photo, what a fantastic view. Must make visiting the cemetery to see relatives a lot easier. So peaceful! What a peaceful place to rest eternaly. Very nice photo. I found you on the list at HYDE daily photo. Beautiful colors in the trees! What a perfectly beautiful picture..The colors are awesome.